All lanes of Highway 99 are back open south of Buhach Road near Atwater following a big rig accident Wednesday morning, according to the CHP. MERCED COUNTY, Calif. (KFSN) -- All lanes of Highway 99 are back open south of Buhach Road near Atwater following a big rig accident Wednesday morning, according to the California Highway Patrol. The major injury crash was reported just after 7 a.m. Authorities say a truck crossed from the northbound to the southbound lanes, going through the center divider. The truck then overturned and spilled its load of grain on the lanes. At one point, traffic was backed up close to 5 miles in each direction. 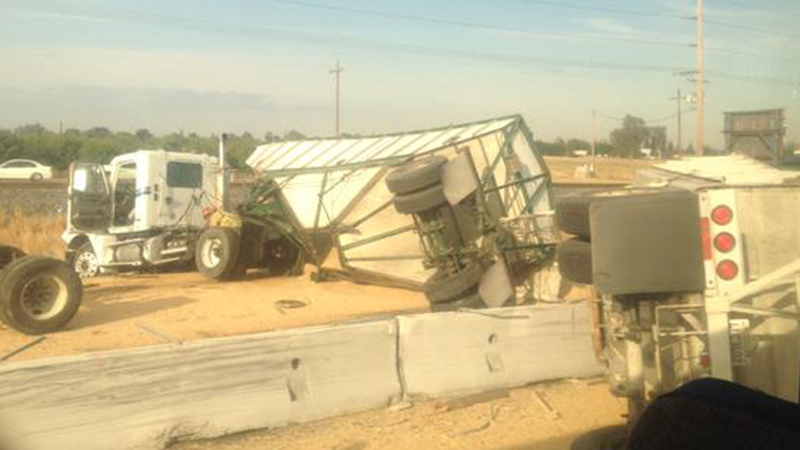 The California Highway Patrol is investigating a big rig accident in Merced County.